The Nifty Thirty Family went to New York City. I would love to say it was my first visit there but it was mine and my husbands second visit. This trip was different from our first visit to the Big Apple, because we brought our children with us. My daughter won the opportunity to dance in the World Dance Championship that was held at the Meadowlands Exposition Center in Secaucus, New Jersey. Talk about exciting. This trip was filled with lots of firsts for my little ones and for my husband and I. My husband and I was nervous about taking our two year old on this trip. 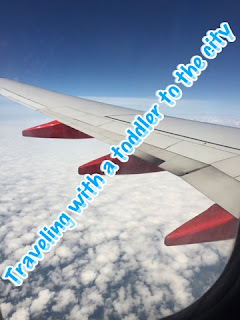 I was nervous on how we were going to get around the city with a little one and how he was going to act where we went. My husband was worried about the plane ride. He was prepared to pass out ear plugs to everyone around us on the plane. But we were going to the World Dance Competition in NJ and we were going into New York City, our daughter might not get this opportunity ever again so I said if little man acts up so be it, it is what it is, he was part of our family and we were not leaving him behind with family members. Where we go, he goes. One of my biggest goals on this trip was to pack very light. I was not wanting to check any luggage. I was able to pack for four people for four days into two carry ons and three backpacks. Pull ups were also included in those bags and my daughters dance costume, make up and jazz shoes were also included. I laid out everyones clothing that they were going to wear each day, included socks, and underwear. I placed each outfit in a pile. The pants on the bottom, underwear, socks in the middle and then the shirt all flat. 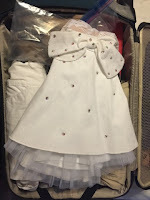 Once that days outfit was ready to be packed, I rolled the pile up very tight and placed the roll in the suitcase. Traveling with only two carry ons does not leave room for that many souvenirs to be brought back, but it is so worth it. We had plenty of space and I packed extra clothing for all of us. The only article I did not roll up was my daughters competition dress. I placed that on the very top. 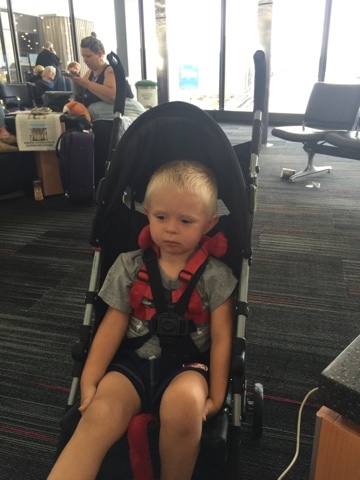 On top of our carry ons and backpacks we toted my sons car seat along with us for the plane ride and we brought his umbrella stroller. Be mindful of the type of stroller you bring. Think about the type of transportation you will be using during your trip. Gate checking a stroller comes in handy. This way once off the plane you place your little one in the stroller. 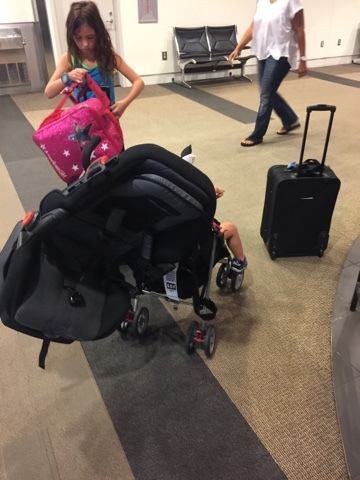 The stroller is ready for your use as soon as you walk off the plane and you can wheel your little one all the way to the plane. You will make it to your destination faster than letting them walk. Just make sure you get the tags to gate check your stroller at the counter at the gate. 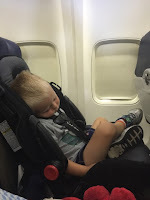 I searched and searched on ways to keep kids hush hush on a plane. I even checked out You Tube videos on how to install a car seat in a airplane and how to tote a car seat in the airport. Car seats are not required on planes, but they come in so handy. 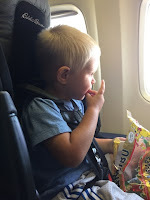 Our son felt secure and was able to see out the planes windows. In my backpack I carried my children's favorite snacks, plus ring pops and some milk for little man. One thing that made me nervous about flying with a little one, I had read how it was hard to bring on milk through security. I had no problem taking two bottles of milk through security. I packed two of those little milk bottles you get from happy meals. I did not open them until they were needed, and I placed them in one quart size bag. Before traveling check the TSA's website, because the rules could change at any time. When we arrived in the Newark airport we had no clue what type of transportation we were going to use to get to our hotel. I thought about having a driver wait on us, but I hesitated on it because I did not know how it worked with a driver waiting on us and if our plane was late and all that. I was thankful I had this hesitation because our plane was delayed over an hour due heavy rains. So when we arrived instead of heading for the cab line we used Uber for the very first time. I was amazed at how quick the Uber drives were at the gate door. During our stay we used Uber, Lyft, and regular taxis. 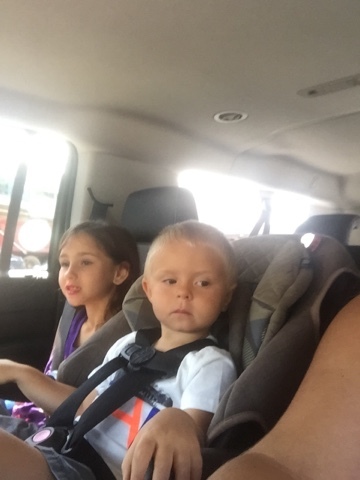 I really liked Uber and Lyft because I could find drivers that had car seats. Don't think every time you want a Uber, Lyft, or Taxi that you are going to get blessed with a car seat. There were several times I had to use the regular seatbelt in the car for my child. (I did not like that). Drivers with car seats charge an extra fee to use their car seat. If your child gets car sick or has a diaper explosion you will be liable to for the clean up charges. I learned this the hard way when my little man became car sick and vomited all over the Uber drivers car and brand new car seat. Not every drivers car has a brand new car seat either. I have read where some car seats are dirty and filthy. We never had that problem. 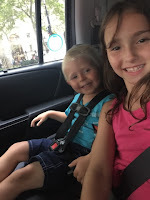 During our trip I did not have the nerve to try the subway or ride the bus with my little ones. It was just easier for my family to ride with Uber, Lyft, or take a Taxi service. I never had any fear about transportation. We realized as soon as our first flight was wheels up, that we were worried about nothing. My little ones did great. The two year old actually did better than my eight year old. Have you had any adventures with little ones and traveling? I would love to hear about it. Stay tuned for more about our trip to the Big Apple. Check out my review on where we stayed at during our trip. It is a good hotel to think about when traveling with a family and on a budget. Click here.